Testimonials - Richard Celler Legal, P.A. My name is [Redacted], and I am a client of your law firm. First, I would like to extend a couple “Thank You’s” to you. -Thank you for personally reaching out to me this week, I really appreciate your time, whereas I know extra time is a scarace commodity nowadays. -Most importantly, I would like to thank you for “Being the voice” for so many indaviduals who normally would not have a voice, if not for your hard-work and efforts. My philosophy is “”One can no longer treat employees any way they want to and get by with it any longer. COMPANIES HAVE RIPPED-OFF EMPLOYEES FOR A HUNDRED YEARS AND CHALKED IT TO PROFIT IN ORDER TO SATISFY STOCKHOLDERS. A little background: These long term nurses came to my office in tears last week, because they were being laid off and other younger less qualified nurses weren’t. I ghost drafted a letter for them to send to HR explaining that they believed that they were not being treated fairly. I included all of the relevant buzz words. I didn’t charge them a dime, didn’t ask them for a dime, and just genuinely took joy and pride in helping them. A day after they sent the letter, they got their jobs back. They sent me this note and this plant. It made my day. It feels good to help people, even when you don’t have a dog in the fight and don’t stand to gain anything. This made my day. “Thank you for everything Richard. You and your staff are awesome. I have a long list of websites where I will give you 5 star reviews. Because of you, we will catch up on our bills and I will continue being a stay at home mom. I want to thank you and express my gratitude for your dedication and support throughout my case. I was touched by your integrity, especially when you made sure my needs were met over your personal financial gain. You have played a vital role in protecting my rights and securing my immediate future. Sincerely appreciate your hard work and all that you’ve done for me. I’ve received the check in the mail. I wanted to thank you for your outstanding work and I appreciate everything you’ve done on my behalf. Celler Legal, P.A. made it so easy to get a free consultation through their website. I felt like I was wrongfully terminated along with other co-workers. Those co-workers were using local lawyers in Brevard County. When it was all said and done they only won fifteen hundred dollars. To me that was unacceptable! 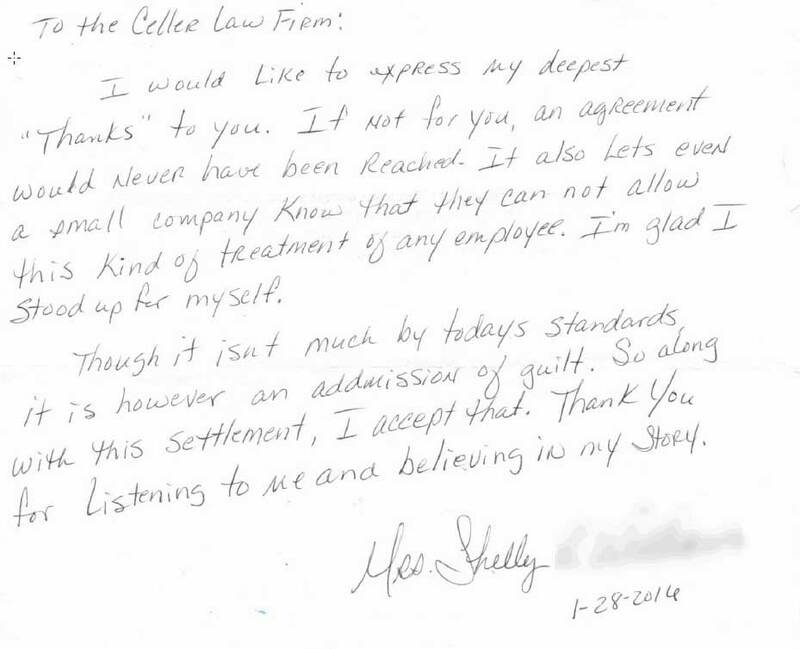 Celler Legal fought for me when I thought I didn’t have a case and won for me. Visit their website for step by step instructions like I did, I felt like a ton of pressure was lifted off my shoulders. L.D. I want to take a moment to say thank you. Things have been going pretty crummy since I lost my job and my home in December of last year. I have depended on my boyfriend and mom to get me through. It seems my faith has grown stronger and my need for material things mean little. Thank you for believing in me. Thank you for taking time to help me. God bless you. Just wanted to thank you for a speedy and outstanding job, all of you did an outstanding job for me. You always kept me well informed and you certainly didn’t waste any time. You can be sure if I need you in the future I won’t hesitate to contact you. Thanks again. “I was very , very pleased on how the firm concerned themselves on my behalf, they showed devotion, caring, and the result was outstanding. The firm committed their resources to my case, and brought an incredible result. I was informed every step of the way in my case through, e-mails, letters, telephone, and even text messages from the lawyer. You can tell in speaking with them that they wanted to help YOU. The Law Firm of Richard Celler will show concern and caring and dedication to your case and definitely follow through. I was very pleased with the firm and how they handled my case, and how they brought back my self esteem, and dignity, and total self respect to my person when I was discriminated against. “When I needed someone to represent me in an employment matter, I chose Richard out of a very long list of seasoned professionals who were eager to take my case. It was the best decision I could have made. It is rare to find someone who thinks as strategically as Richard. Combined with his impressive knowledge of the law, he is a formidable ally to have on your side. On top of all that, he is extremely friendly and easy to work with. ” Mr. Celler explained to me the laws that were in place, including limits on how much I could receive and the time limits on each step of my religious freedom suit against the company that refused to hire me because of my religious(Jewish) beliefs. Mr. Celler explained all of his answers, and always asked if I had any more questions before we finished each call. Unlike many lawyers, Richard didn’t go flaunting the big words because he could. He kept everything so that a lay person could understand everything. Another great thing was that unless he was with another client, he took my calls every time. “I have known Richard for over 12 years. He is a formidable attorney and a zealous advocate for his clients. He has worked at a high level at both defense and plaintiff oriented firms and brings that knowledge to each and every matter he handles. Most of all though, Richard is a generous colleague and willing to share his experiences with members of the Bar.” Gina C.
“Rich Celler’s work ethic and integrity are second to none. He clearly explained everything I needed to know and responded to my calls promptly. Thanks Rich!” Amanda W.
“Richard Celler is a strong, steady and experienced attorney when it comes to protecting those hourly workers victimized by employer related wage theft in South Florida. Wage theft is serious business and it is far more prevalent than most realize. Richard has wide knowledge base on the subject and is adept at getting results.” – John G.
The details of my case against my former employer are too long to detail here, but suffice it to say I was badly mistreated and laws were violated. I badly needed legal help and I needed someone whom I could trust and count on. It is my very good fortune to have found Richard. I knew from the start that I had found a top-notch attorney…his command of the law, his command of the details, his skill, and his eagerness to fully and completely hear me out, was so refreshing and confidence building. As we wound our way through the courts and the legal process I only grew to appreciate him more and more. I remember listening to him plead my case in Federal Court and thinking to myself, “Wow. This guy is just amazing.” And his results were amazing too. Richard won my case in dramatic fashion, securing for me a verdict that some say is a Florida record for the laws we sued under. Could the case have been won some other attorney? Perhaps. Could the win and the size of the verdict been achieved by some other attorney? I don’t think so. So, I say to anyone who has a case related to employment law… if you simply want to “win” you can hire any attorney and have a decent chance. But if you desire to win “big”, then you need the best of the best in your corner. Hire Richard Celler. Period. If I can offer anyone advice on this, or if someone wishes to hear more about my wonderful experience with Richard, please don’t hesitate to contact me.